Lauren Grela – Lauren is also a Freshman at Ursuline Academy. She has been running since 7th grade, originally taking up the sport to have fun with her friends and follow in the footsteps of her sisters. Lauren has grown over the years as a competitor and loves being part of her team, the hard workouts and the racing. We are pleased to be able to offer her a Walter Burgess Scholarship so that she can take her many talents as a team player and strong competitor to the American Running Camp. John Keaney – John started running for a team in middle school and he has done track ever since. He just finished up his Freshman year at Dedham High School. John has made great progress this year as a distance runner as part of his high school’s cross country, indoor and outdoor track teams. American Running Camp will give him the tools and knowledge to build on his confidence so that he will continue to excel. We know that Walter would be proud to sponsor John in these efforts. John Dowling – John will be a Senior at Dedham High School this fall. He was encouraged to try track in his sophomore years by many of his friends. Having little experience with running, he improved with every practice and learned to love the challenge. He feels that not only does track allow him to compete as a member of a team, but it allows him to compete against himself. With that mindset, the American Running Camp can only help John improve his running skills and teammate interactions – another worthy Walter Burgess Scholarship recipient. Mallory Moholt – Mallory is a Junior at Smithsburg High School, MD. When Mallory first started to run, she questioned the reasoning of running at all – one works so hard with little recognition. Over the years she has come to realize that, most importantly, she runs for those who can’t. And then, there is the drive that urges her on when she thinks she can’t go any further – the drive that makes ones heart take over when ones legs have reached their limit. Mallory is looking forward to this Camp to help her learn different techniques, drills, and maybe a whole new way of training. From PRC’s perspective, Mallory runs because Walter can’t, and she thrives to improve for the love of the sport. Walter couldn’t ask for more than that, nor could PRC. 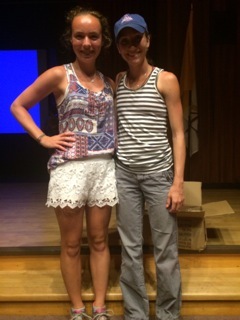 Catherine Treseler with Kerri Gallagher, who is headed to the World Championships! Catherine Treseler – Catherine is a resident of West Roxbury and she is a Freshman at Ursuline Academy. She has been running since she was 7 or 8 years old, when she didn’t really like it at all. However, a few years ago, during the Corrib Road Race, she caught the bug. Now, Catherine loves running for the friendships she has made, the enjoyment of nature, and the energy and relaxation it affords her. She is a huge asset to her track team, as she herself zeroed in on a sub 6-minute mile. 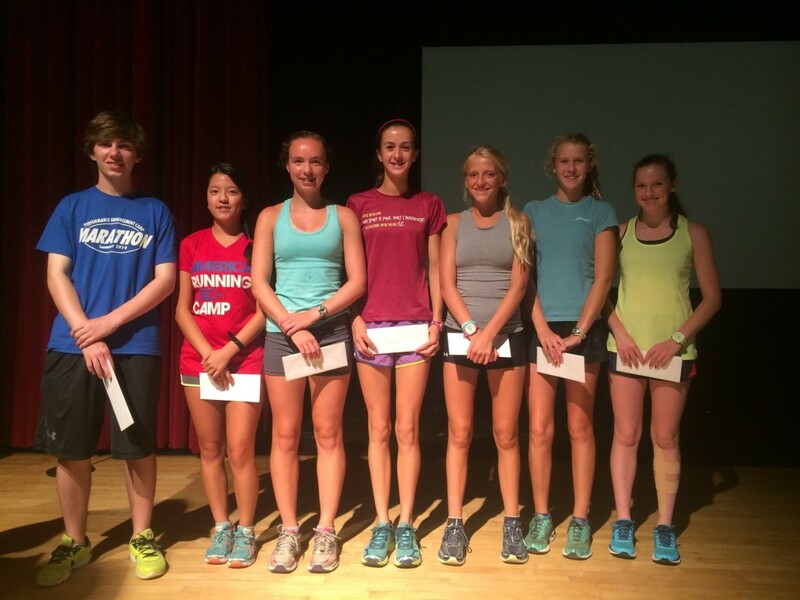 We hope that the American Running Camp will continue to help Catherine to excel and even enhance her love of running. Eleanor Lawler – Eleanor is a Freshman at South Kingstown High School , RI. Eleanor started running in middle school and after a season of hard work, quickly realized how much she loved to run and be part of a competitive team. She is a high honors student, a member of the Varsity Cross Country Team (winning or placing in numerous State and Regional events) and the Swim Team. Having attended the American Running Camp day program, Eleanor knows the value of this experience and is eager to participate this year as an overnight camper. We are pleased that in Walter’s name, we are able to give her this opportunity. Colleen Gallagher – Colleen is a Sophomore at Bishop Kearney High School, Brooklyn, NY. Colleen was influenced by her cousins (who all ran track at Bishop Kearney before her) to take her running to the next level. Her cousin, Kerri Galligher, an organizer at the American Running Camp, has qualified to compete in the World Championships in Beijing in August. Running is most likely in Colleen’s genes! She found out just how much she loved running when she was injured last year and couldn’t run for months. She has come back with a passion for the sport and a desire to learn and improve her performance through her experience this summer at the camp. Walter would be so proud to be part of Colleen’s growth as a runner, and we are proud to help that happen through his Scholarship. Cloe Charbonneau – Cloe is a Sophomore at Guilford High School, CT. Chloe started running in 7th grade and through the 8th grade was encouraged by the other girls on the team to become a better runner. She now wants to be like these girls and become a role model for the incoming freshman joining the Cross Country & Track teams. She wants to attend the American Running Camp to better herself as an athlete and learn new ways to keep herself healthy throughout her running career. She has already started giving back to other runners by volunteering at a number of track and cross-country events at her school. She has the true Walter Burgess spirit and is a much deserving Scholarship recipient. Shayna Yacshyn – Junior, Gardner High. Shayna is interested in learning the correct fundamentals of running and is eager to become the bes athlete she can possibly be! She has volunteered in a local hospital, as a coach for the 4th grade basketball team, as a student leader teaching K-2 children about exercise, and helped raise money for Haiti. She and her brother both will be attending the American Running Camp, and in order for her family to manage that, she needed this scholarship. Walter would be the first one to give it to her!